In the 9th month of the first year of King Gambrach, the prophecy of Wahala Morghulis pronounced by Shiwajun came to pass. Abushola ascended to the seat that the Apicurians had reserved for Lar-Wan, but in the first Centjoury of Gambrach the senatii adjourned for vacation more than to sit over the affairs of the kingdom. And yea, in that time did a cry go out against Abushola that whilst he was King of the lesser kingdom of Kwarapotamia, did he on a dozen and one occasions declare falsely of his property before the Tribunal Conductivitis. And lo, did the Warden of Conductivitis bring charges against Abushola (whose name they sought to change to Ananias – his wife had almost been Saphiratised herself) which wouldst unseat him as Warden of the senatii. “Shiwajun persecuteth me”, cried Abushola Ananias, “rise up ye people of the Kingdom against this impunity!” But the people were divided – those of Apicuria professing that this was age of Gambrach where none was sacred; those of Padipalia describing it as a barbaric trial by ordeal, the people of the Fence long since having dispersed. And Gambrach unlooked it all. It was said that Gambrach was sore in anguish, for he longed for his Council to be filled with only upstanding men. And he had searched high and lo, far and near for Councillors and only found 3. But of his smaller wider council, had he made appointments but mostly men from the northern kingdoms. And when it was asked why he marginalised the rest of the kingdom so, he answered, “I wouldst be a fake guy, if I compensateth not my ride or die homies.” Pressed further, on separate occasion, Gambrach remarked that members of the Council were only as useful clanging cymbals at any rate. And thus did it bewilder many that the palace of Gambrach wouldst contend with Abushola Ananias, for the approval of the senatii was required for the appointment of the council. But there was a measure of reprieve when Gambrach spake that which he had kept in his heart, that the fullness of time and the end of the 9th month were one and the same. So the people sat in anticipation. And in that time also was there a King in Oshunlonica by the name of Ogbenysius. Ogbenysius was famed for being ascetic and frugal in his ways. Yea, was he famed for subduing the raging beast Coasterbussium and riding in triumphantly into the town square. But Oshunlonica became bankrupt under Ogbenysius and he was unable to pay state workers their wages. In fact, many of the lesser kingdoms under Gambrach had depleted coffers and were unable to pay their workers’ wages. And lo, did they petition Gambrach for interventi bailoutfundi. And Gambrach was moved to answer them with compassion. But not all were satisfied. Still in this time, the people of Gideria looked unto Ambsalom, successor to Fasholam, favoured of Shiwajun, to assuage the menace of falling oxcarts and carriages and cratered pathways. Lo, for 2 weeks in Gideria, was there a daily gridlock and passage to and from the gidiopolis was greatly enstrangled. But Ambsalom was neither seen nor heard. And yea, was a word raised against Fasholam, alleging his fame was a mere façade and he was as ordinary a king as his peers had been. Fasholam responded with a proverb about wrestling with swine and being covered in mud. Who are the swine? Shiwajun and Ambsalom? Or others whom Fem Callamitus didst christen the wailers who wail about wailing? All this had gone on and continued during the first Centjoury and the next few days, leading into the festival of Ram. The festival of Ram was holy time of prayer and thus didst Abushola Ananias return from his travails at Conductivitis to his kinsmen in Kwarapotamia to offer prayers. Lo, was there a stirring amongst his kin and twas written of them that they chanted “Thief, Thief” and threw transparent gourds of water at him and the kings guard had to whisk Abushola Ananias away. Abusholam, through his scribe BanksAMakeAmDance, ascribed the disruption to workers being disgruntled at Kwarapotamia being in the same condition as Ogbenysius’s Oshunlonica. Far away, from whence he also observed the festival of Ram, Shiwajun chuckled again to himself. 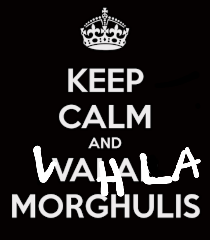 Wahala Magnum Morghulis, he said. I always love reading from you. Fasholam, Shiwajun, Gideria, Kwarapotemia. Loooool. If the concerned real names catch you. Good humour. Lolol! Goodness me, what a (superb) take on things. Well done! Thanks. Check out previous episodes of The Chronicles, if you have a minute.